Japan. This destination has been requested by several of my regulars and when they speak I listen. I am so excited about our first group trip to culturally rich Japan. 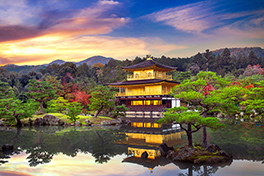 You will explore Japan’s ancient roots and modern wonders on a thrilling journey through it’s history and culture. Contact me if you would like information on extending your vacation by coming early to Tokyo or staying a little while longer in Kyoto. Those optional tours will be available in the Spring. We will be flying as a group from Los Angeles, CA (LAX) to Japan. 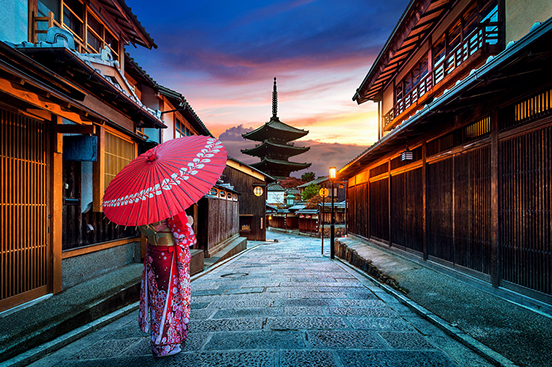 Please look at this wonderful itinerary and act quickly to join this group to Japan. ​Upon arrival at Narita or Haneda airport, clear immigration and proceed to the arrivals hall, where our representative will greet you and assist you to the coach for your transfer to the hotel. After check-in, the remainder of the day is at leisure. Check in: 2 pm and after. 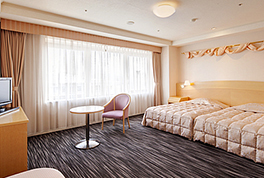 ​The hotel is located at the top of Zakuro-zaka street, which inclines up from the Takanawa exit of Shinagawa Station. 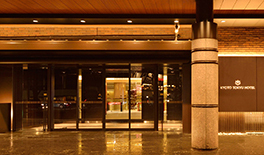 The hotel is located in an urban resort environment that also includes convention facilities such as the Hiten banquet hall and the International Convention Center Pamir, as well as a wide variety of Japanese, Western, and Chinese restaurants. All rooms have balconies. This morning, head south from Tokyo to Kamakura and arrive at the Jomyoji Temple. Here you will be served matcha green tea and Japanese sweets in the refined atmosphere of the temple's 400-year-old tearoom. Admire Jomyoji's exquisite rock garden, then walk through the grounds of Hokokuji Temple, known as the 'bamboo temple' because of its beautiful bamboo grove. After a lunch of authentic Japanese-style meal, continue to Kotoku-in Temple and the infamous 13-metre-tall Great Buddha statue [at left]. Afterwards, cross a 600-metre high suspension bridge to Enoshima Island and take a walk along colourful Benzaiten Nakamise shopping street. Finally, ride the escar up to Enoshima Shrine, which offers ocean views on a clear day. Return to your hotel in Tokyo after the tour. Today you will take a tour of the city of Tokyo. Your tour will start with a drive by of the National Diet Building which is the center of the Japanese Government. Don't let the impressive Western-style architecture fool you, this building is constructed almost entirely out of pure Japanese materials. Then you will pass the Imperial Palace [at right], which was formerly known as Edo Castle, this palace is the residence of the Emperor of Japan. 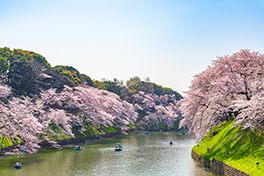 The grounds are lush with green foliage and provide a relaxing spot for Tokyoites and visitors alike. Visit the Tsukiji Outer Market which is Japan's No.1 place for seafood with over 400 shops including fresh fish retailers, grocers, and restaurants. Enjoy shopping and try some local food while exploring this one-of-a-kind location. On your way to the Tokyo Skytree Town, you will pass the Kabukiza, a classic Japanese-style theater where traditional Kabuki performances are held. Your next stop is the Tokyo Skytree Town where you will have some free time to explore Tokyo Skytree and Tokyo Solamach which features many traditional Tokyo shops, an aquarium, planetarium, and more. Continue on to the Senso-ji Temple & Nakamise Shopping Street. Senso-ji, Tokyo's oldest temple, offers plenty to see including the bright red Kaminarimon Gate, a statue of the god of thunder, and a five-story pagoda. The bustling street known as 'Nakamise' stretches for about 250 m from Kaminarimon Gate to Senso-ji Temple and is filled with a plethora of shops. Continue on to Asakusa and enjoy a short stroll around. Leave Tokyo by coach for Hakone. You will drive half way up Mount Fuji to the 5th Station for a spectacular view of the surrounding countryside from a sight 2,300 meters. After a Japanese style lunch you will enjoy a cruise on the beautiful Lake Ashi followed by a scenic ride on the Hakone Ropeway (one of the world's longest aerial lifts) with a view of the volcanic Owakudani Valley. Continue on to your hotel in Hakone for check in. Please note: Baggage will be separately transported from Tokyo to your hotel in Takayama with allowance of 1 piece per person. Please arrange an overnight bag for your stay in Hakone. This morning, you will be transferred to Odawara Station for your Bullet Train to Nagoya Station. On arrival at Nagoya Station, you will change trains and board the Limited Express Train to Takayama Station. On arrival, board your coach to enjoy a sightseeing tour of Takayama. This tour will include the Yatai Kaikan Hall, which houses some of the Takayama Festival's towering floats. Then you will visit the Kusakabe Folkcraft Museum followed by some free time to stroll in the old town called the Kamisannomachi. Transfer to the hotel for check in, where your luggage will be waiting for you. The remainder of the evening will be at leisure. ​One of the advantages of Hida Hotel Plaza is its ideal location, right in the center of Takayama. 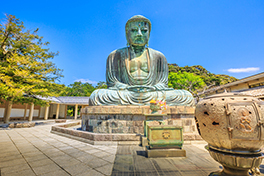 Most tourist attractions, such as the old streets of Takayama, the Higashiyama Walking Course, the morning market along the Miya-gawa River, the Hida Kokubunji Temple, and the Takayama Jinya (a historical government house), are within a 15 minute walk from the hotel. Enjoy the mineral rich hot spring, which comes from a source inside the hotel, and relax as you thoroughly warm your body and soul. 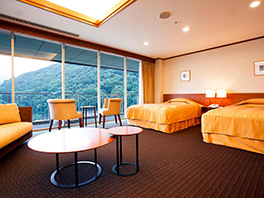 Recover from the fatigue of your busy life, and enjoy a truly relaxing stay in Japan. After a relaxing bath, enjoy a delicious meal prepared with seasonal ingredients. You will be totally satisfied with the range of food available here. Enjoy tasty creative Japanese cuisine, traditional local dishes, and even French or Chinese dishes incorporating fresh seasonal ingredients of the region. You will depart your hotel today, and visit the Miyagawa Open Air Market. Enjoy walking around the bustling the market, where a wide array of local specialties and other products are available. Then you drive by the Miboro Dam before heading off to the Shirakawago Observatory to enjoy an elevated view of the World Heritage-registered thatch-roofed village of Shirakawago [at left]. Great for photography! Enjoy lunch at a local restaurant where you can taste the delicious regional cuisine. After lunch you will head over to Wada House, a traditional thatch-roofed farmhouse. This is one of the thatch-roofed houses, also registered as a World Heritage Site. Look around and be fascinated by the culture and history of the village. 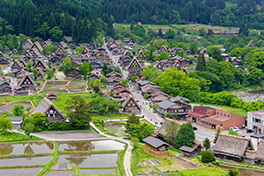 Your last stop for today is Shirakawago village where you will have some free time to enjoy a leisurely stroll. Transfer to the hotel in Kanazawa after the tour. Please note: Baggage will be separately transported from Takayama Hotel to your hotel in Kyoto with allowance of 1 piece per person. Please arrange an overnight bag for your stay in Kanazawa. The hotel's dedicated staff will transport our luggage to one of their beautiful rooms or point you to their lovely Kenroku-En Garden. Restaurants in the hotel serve Chinese meals, teppanyaki, or traditional Kanazawan fare, or you may order a meal from their extensive room service menu. 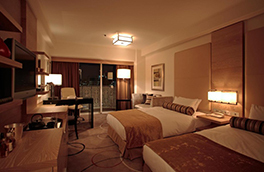 Crowne Plaza Hotel Kanazawa also features Wi-Fi and workout facilities. After breakfast you will depart your hotel and head to Nomura Residence and the Nagamachi Samurai District. 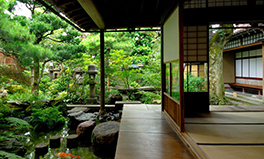 Here you will visit a former residence of a samurai family from the Kaga Domain. Admire the traditional architecture and gaze at the beautiful Japanese garden. Next stop is the Kenrokuen Garden [at left]. This beautiful garden is considered one of the top three Japanese gardens. It offers amazing seasonal views all year round. Drive onward to Higashi Chaya-gai, wooden-latticed exteriors of teahouses line both sides of the stone-paved street here where something from the Edo period (1603-1868) still lingers in the air. This area is an Important Traditional Building Preservation District. The last sightseeing spot for the day is Hakuza Honten where you can purchase handicrafts, accessories, cosmetics and other items made with gold leaf. Transfer to Kanazawa station where you will have some free time for lunch (at own expense). Board the Limited Express Train in First Class from Kanazawa Station to Kyoto Station. On arrival at Kyoto Station, you will be transferred to the hotel for check in, where your luggage will be waiting for you. In Japan’s ancient imperial capital, the Kyoto Tokyu Hotel is a serene, contemporary haven perfectly placed amid the narrow streets that shelter Kyoto’s temples, gardens, and shrines. With a gleaming lobby, grand open-plan public spaces, discreet courtyards, and relaxing water features, the hotel has a simple but exquisite aesthetic. Dining options will take you on a culinary journey around Asia, while balmy nights on the floating terrace create memorable contemplative moments. The hotel's 408 nature-inspired guestrooms have green tea sets and yukata nightwear. 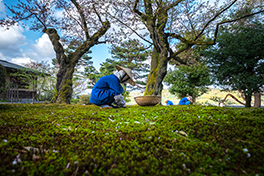 After breakfast, you will set out to explore some of Kyoto's most famous sites and discover the history behind this one-thousand-year-old capital. Tour Nijo Castle, noted for its gorgeous interiors and its 'squeaky' nightingale floors which alerted residents to unwanted intruders. Continue to Kinkakuji Temple [at left], famous for its Golden Pavilion covered entirely in thin layers of pure gold as well as for its exquisite Japanese gardens and koi ponds. 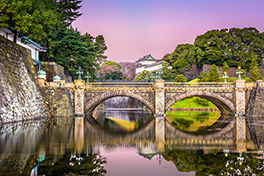 Visit Kyoto's Imperial Palace, followed by a buffet lunch at a local restaurant. After lunch, continue on to Sanjusangendo Temple, home to the world's longest wooden structure which houses over a thousand life-sized statues of Buddhist deities. 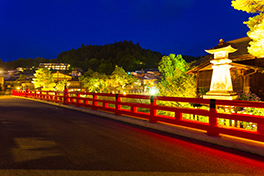 Finally, proceed to the Kiyomizu Temple before being transferred back to your hotel in Kyoto. Today you will be transferred to the Osaka Kansai Airport for your departing flight. Airfare Round Trip from Los Angeles, LAX is not included. Make your check payable to Aviva Travel Group. OR you may pay by debit or credit card. Fill out your information on the registration form and fax it to Aviva Travel Group at 630-559-8845. You can also scan the form to your computer and email to avivatravel@aol.com.